I've got quite a lot of 'tempahan baju kurung moden with fluffy hands' from my utm's friends. It's different from last year, which my officemate @ PTPL shah alam kept me suffering with their requests. I was sewing like hell, and being the last person balik kampung. This year, I managed to plan my schedule.. Haha! I've stopped taking the order 2 weeks before the date that I've planned to go back home.. although the income was not as much as last year, I still felt so satisfied since all my customers were satisfied with my work , and the most happiest thing is, i'm the FIRST PERSON who 'balik kampung' this year..hahaha.. sejarah takkan mungkin berulang, ok! We were all wearing in purple on the 1st of Syawal and the feel for Hari Raya is quite different compared to last year. My beloved mom and angah prepared a special menu for us on that day. 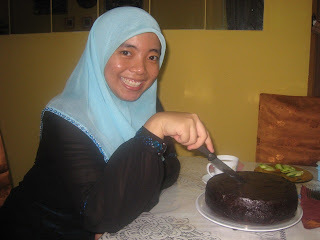 My wink-wink also came with a chocolate cake prepared by his mom. Thank you everybody (including to those who were still remembered my birthday)! Love u all so much! * tempahan baju dibuka semula pada bulan November & Disember. Oktober- REHAT.